Two starving and abused horses that were rescued from a boarding facility in Miami Gardens were recovering Monday, according to the South Florida Society for the Prevention of Cruelty to Animals. The Paint horses were found Sunday at the facility, nailed inside a stable that had to be torn down to reach them, the SPCA said. SPCA spokeswomna Laurie Waggoner said they were called by Miami Gardens Police to take care of the emaciated horses. "They were in filthy, disgusting, deplorable living conditions, stalls made out of pallets, several inches thick with manure," Waggoner said. The horses, a gelding and a mare, were left inside to die, according to the SPCA. "Left without water, the horses were eating wood and their own manure (feces) in order to survive," Waggoner said in a statement. 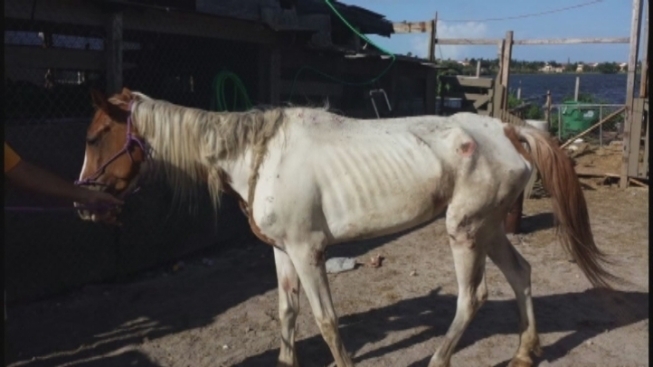 Authorities are investigating after 11 emaciated horses were found on a property in southwest Miami-Dade Monday morning. Laurie Waggoner and Silvio Gonzalez of the SPCA and neighbor Maria Tamayo spoke about the case. Miami-Dade Police said the property's owner, Elma James Burgess, has been charged with 11 counts of animal cruelty. He could not be reached for comment Monday, and it wasn't immediately known whether he has an attorney. Waggoner said the mare has a 50 percent chance of survival, and suffered from cuts and scrapes and a huge hole over her hip bone. The gelding was in slightly better condition. The SPCA has established a special fund to help with the immediate care of the horses. To donate visit the SPCA's website or http://www.crowdrise.com/paintbucket.